Woke up Saturday morning feeling some excitement. My flight from Portland, Oregon to Spokane, Washington was essentially a fairly routine one. While I have never flown that sector before, I have been to both airports and both cities a few times now. Our plane was N744SW. This 737-700 first flew for Southwest on 26th March, 1999 and has 137 economy seats. I was surprised to easily get 11D, an aisle seat in the emergency exit row. While it does not have much more leg room, the seats in row 10 do not recline and there are only 2 people in the row. Friendly welcome from the on board Southwest team (as always). Contrast that to the usual grumpiness at United, the surliness of American and the cool aloofness at Virgin America). I shared with the crew 3/4 through the flight about how my "hobby" of recording my flights started. Just before his death, my friend Tony Chapman set up a Flight memory account into which he painstakingly entered 100s of my flights from my junior jet club book and frequent flyer statements). Thanks Southwest for a memorable 737th flight - six stars today! Below is a table summarising of all of my flights- 3.2 months inside planes with 76 airlines to five continents- one million miles of flying (and because I offset my carbon emissions many, many trees). More at my Flightmemory. 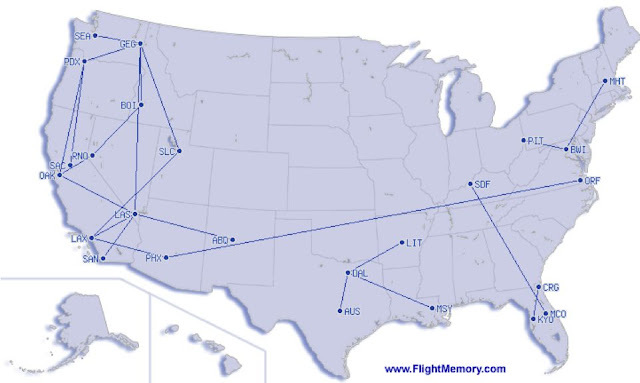 Of all my flights, 193 (just over a quarter)have been in 737s. I wish you could make century of leaving ground but the thing is how many times you get cheap flights and which destination is giving less expense on flights. Hello to every , since I am truly eager of reading this website's post to be updated on a regular basis. It contains pleasant information. question in which I'd like to ask if you do not mind. I was curious to find out how you center yourself and clear your mind before writing. I've had difficulty clearing my thoughts in getting my thoughts out there. Hi there all, here every one is sharing these kinds of familiarity, thus it's nice to read this webpage, and I used to pay a quick visit this webpage everyday.